Richard Craig Shelby (born May 6, 1934) is an American politician serving as the senior United States Senator from Alabama. First elected to the U.S. Senate in 1986, he is the Chairman of the Senate Appropriations Committee, succeeding Thad Cochran. He previously served as Chairman of the U.S. Senate Committee on Banking, Housing, and Urban Affairs and Senate Committee on Rules and Administration. He is the longest serving U.S. Senator from Alabama, surpassing John Sparkman who held the previous record. In 1986, Shelby won a tight race as a Democrat for the U.S. Senate. In 1994, the day after the Republican Revolution in which the GOP gained the majority in Congress midway through President Bill Clinton's first term, Shelby switched party affiliations and became a Republican. Shelby was re-elected by a large margin in 1998 and has faced no significant electoral opposition since. He is currently the dean of the Alabama delegation. Shelby was born in Birmingham, Alabama, the son of Alice L. (née Skinner) and Ozie Houston Shelby. He graduated in 1953 from Hueytown High School in Hueytown, Alabama, then the University of Alabama, receiving an undergraduate degree in 1957. He attended the Birmingham School of Law, where he earned his Juris Doctor in 1961. He was admitted to the Alabama State Bar on August 29, 1961. He received an LL.B. from The University of Alabama in 1963. Shelby is a member of the American Bar Association and Alabama State Bar, as well as the American Judicature Society, Alabama Law Institute, Delta Chi Fraternity, and Phi Alpha Delta legal fraternity. Shelby was a city prosecutor in Tuscaloosa, Alabama from 1963 to 1971. From 1966 to 1970, Shelby was a U.S. Magistrate for the Northern District of Alabama; from 1969 to 1971, he was a Special Assistant State Attorney General. 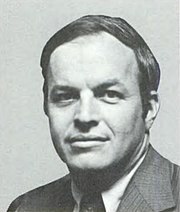 Shelby was elected to the Alabama Senate in 1970 and served until 1978. That year he ran for and was elected to the U.S. House of Representatives from the Tuscaloosa-based 7th district from which Congressman Walter Flowers was retiring. He was re-elected three times. Shelby was one of the more Conservative Democrats in Congress, and a member of the boll weevils, a group of moderate to conservative-leaning Democrats who often worked with Republican President Ronald Reagan on defense issues. In 1986 U.S. Senate election in Alabama, Shelby won the Democratic nomination for the Senate seat held by Republican Jeremiah Denton, the first Republican elected to the Senate from Alabama since Reconstruction. He won a very close race as the Democrats regained control of the Senate. He was easily re-elected in 1992 even as Bill Clinton lost Alabama's electoral votes. On November 9, 1994, Shelby switched his party affiliation to Republican, one day after the Republican Revolution in which they won control of both houses in the midterm elections, giving the Republicans a 53–47 majority in the Senate. He won his first full term as a Republican in 1998 by a large margin. He has since faced no significant opposition in 2004 or 2010. He was re-elected to a sixth term in 2016. A September 2009 poll showed Shelby had a 58% approval rating, with 35% disapproving. In 2014, The Wall Street Journal criticized Shelby for hoarding campaign and PAC contributions and not sharing them with other colleagues. In 1987, Shelby opposed President Reagan's nomination of Robert Bork to the Supreme Court, a move attributed to lobbying by Alabama African-American leaders who reminded Shelby that he had relied on support from black voters in narrowly defeating Denton in 1986. However, in 1991, Shelby supported President George H. W. Bush's conservative Supreme Court nominee Clarence Thomas. In 1991, Shelby sponsored legislation granting federal recognition to the MOWA Band of Choctaw Indians. Though confident it would pass, Shelby stressed the "need to get more documentation regarding establishment of their tribal identity." The Senate Select Committee on Indian Affairs voted 11 to 2 in favor of the legislation on July 18. Shelby publicly feuded with President Bill Clinton during the first half of Clinton's first term. At a meeting with Vice President Al Gore, he turned to the TV cameras and denounced the Clinton program as "high on taxes, low on [spending] cuts". In 2002, with George W. Bush in the White House, Shelby reintroduced his language, but then-Attorney General John D. Ashcroft said that "rigorous investigation" and enforcement of existing laws—not new legislation—were the best way to fight leaks. In 1991 Shelby supported the 1991 Crime Bill S.1241 sponsored by then Senator Joseph Biden that instituted a national waiting period for handgun purchases as well as a federal ban on semi-automatic firearms. In January 1992, Shelby met with Chair of the Federal Reserve Alan Greenspan, advocating for the basic cost of money being reduced from 3.5 percent to 3 percent to assist with the stimulation of the economy. Shelby confirmed afterward that he intended to vote for Greenspan for another term as Federal Reserve Chair and said that Greenspan was not opposed to his suggestion to cut the discount rate to its lowest in twenty years in addition to agreeing with him on the need for a restoration of investment tax credits and a special tax rate for capital gains along with the providing of incentives to encourage savings. Shelby was highly critical of CIA Director George Tenet in the aftermath of the September 11 attacks. From 2003 until 2007, he chaired the Senate Committee on Banking, Housing and Urban Affairs. He is[when?] a member of the Appropriations Committee where he chaired its subcommittee on Commerce, Justice and Science and Special Committee on Aging. He lost his chairmanships in 2007 when the Democrats regained control of the Senate. In 2004, a federal investigation concluded that Shelby revealed classified information to the media when he was a member of the Senate Intelligence Committee. Specifically, Shelby revealed classified information on June 19, 2002 to Carl Cameron, the chief political correspondent on Fox News. The information consisted of two messages between Al-Qaeda operatives intercepted by the National Security Agency on September 10, 2001, but not translated until the day after the attacks—"the match is about to begin" and "tomorrow is zero hour." The Department of Justice declined to file criminal charges against Shelby and transferred the case to the Senate Ethics Committee. The committee in 2005 concluded its probe into the alleged leak. Shelby, in his role as chairman of the Senate Committee on Banking, Housing, & Urban Affairs, opposed proposed legislation that would have permitted additional competition in the title insurance industry. Shelby is currently co-chair of the Congressional Privacy Caucus and Zero Capital Gains Tax Caucus. He is also the Senate co-chair of the National Security Caucus. In addition, he is a member of the National Republican Senatorial Committee and the Senate Centrist Coalition. In March 2009, as the Obama administration was expected to reverse limits on embryonic stem-cell research imposed by the Bush administration, Shelby said, "My basic tenet here is I don't think we should create life to enhance life and to do research and so forth. I know that people argue there are other ways. I think we should continue our biomedical research everywhere we can, but we should have some ethics about it." Later that month, Shelby was one of fourteen senators to vote against a procedural move that essentially guarantees a major expansion of a national service corps. The bill was estimated by the Congressional Budget Office to cost at least an outlay for the fiscal year 2010 of $418 million toward around $5.7 billion from 2010 through 2014. In February 2010, Shelby placed a hold on more than 70 of President Obama's nominees to various government posts, in a protest over an Air Force KC-135 Stratotanker contract and the FBI's Terrorist Explosive Device Analytical Center. Shelby lifted all but three of the holds 3 days later, saying that "The purpose of placing numerous holds was to get the White House's attention on two issues that are critical to our national security—the Air Force's aerial refueling tanker acquisition and the FBI's Terrorist Device Analytical Center (TEDAC). With that accomplished, Sen. Shelby has decided to release his holds on all but a few nominees directly related to the Air Force tanker acquisition until the new Request for Proposal is issued." White House spokesman Robert Gibbs criticized Shelby for "hold[ing] up qualified nominees for positions that are needed because he didn't get two earmarks"; Shelby denied the holds were over earmarks. Shelby's high campaign contribution spending has been criticized; from 2008 until 2014 he had reimbursed himself and his wife more than $500,000 from his campaign and leadership PACs. The Wall Street Journal called him a "stingy lawmaker". In May 2011, Shelby was one of five Republicans to vote against a Republican bill expanding offshore oil and gas drilling in U.S. coastal waters and requiring the Interior Department to complete multiple offshore lease sales in the Gulf of Mexico and off the coasts of Virginia and Alaska. In March 2015, Shelby announced the Senate Banking, Housing, and Urban Affairs Committee would "review proposals aimed at providing greater clarity in Fed decision-making and at reforming the composition of Federal Reserve System" and that he had asked for input from the original regional reserve bank presidents for the Federal Reserve. In March 2017, Shelby referred to Supreme Court nominee Neil Gorsuch as "an outstanding nominee" who Republicans should make sure if Democrats wanted to filibuster and said he was not worried about the changes to the filibuster rules affecting the Senate, citing the Democrats as having used "nuclear option" first. In December 2017, after Senate Judiciary Committee Chairman Chuck Grassley issued a statement requesting that the nomination of Brett Talley for federal judge in Alabama be withdrawn, a spokesman for Shelby stated that Shelby considered Talley "a great young attorney" and had spoken with him the previous week while asking "for his letter of withdrawal in hopes that Mr. Talley can gain more experience." In August 2018, after Rand Paul proposed an amendment to tie a spending bill to the funding of Planned Parenthood, Shelby warned that the amendment could attract supporters while concurrently becoming a spoiler for a larger government spending bill. In September 2018, Shelby reported that the House and Senate were close to a deal on a third package of spending bills for 2019. Representative Nita Lowey disputed the claim, saying that she did not believe a deal would be reached until after the House adjourned and a Republican aide in the House of Representatives responded that there was no time to complete the package. In November 2018, Shelby, Senate Majority Leader Mitch McConnell, and John Thune met with President Trump at the White House, Shelby stating after the meeting that he told Trump the Republicans should avoid a partial government shutdown over Trump's wishes for a border wall and that he was unsure of Trump's position having been affected by his comments. 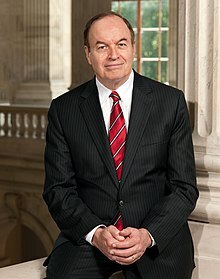 In February 2019, after President Trump delivered the 2019 State of the Union Address, Shelby stated that the address was a reiterating of the president's support for the U.S.-Mexico border wall and confirmed an interaction with House Appropriations Committee Chairwoman Nita Lowey, a leading Democratic negotiator. Shelby has an A+ rating, from the National Rifle Association for his support of gun rights. In 2016, Shelby voted against the Feinstein Amendment, which sought to stop the sale of firearms to people known or suspected to be terrorists. Upon being asked by Scott Wapner on why he voted against it, Shelby said "I do believe that we should keep guns out of the hands of terrorists, would-be terrorists, and a lot of other people." In 2010, Shelby initially opposed the Republican Party's moratorium on earmark funding. Shelby has supported development of the Space Launch System (SLS), but disagreed with how funds for the program have been spent. He favors competition for the strap-on booster design. The SLS earmark has been opposed by fiscal conservative groups, including the Tea Party. When President Obama decided to cancel Constellation, the Bush-era NASA program that was to provide the U.S.'s next manned rocket and instead give NASA a new $6 billion to ramp up a commercial space industry while NASA studies deep-space missions, Shelby ridiculed the plan as a "faith-based initiative". Both under the Bush Administration, in 2008, and the Obama Administration, beginning in 2009, Shelby was vocal in his opposition to bailing out the banks and other corporations (such as AIG). In 2010, Shelby voted to block three amendments to regulate banks, including an amendment #3812 to S. 3217 to cap ATM fees at $0.50 per transaction, and to bar banks borrowing taxpayer money through TARP funds to use those funds for their own benefit. Shelby also believes that bank oversight violates the right to privacy and is against the Government Office of Financial Research being able to collect the financial data it needs to regulate the bank industry. In 2011, Shelby opposed the nomination of Nobel Economics Prize laureate and Massachusetts Institute of Technology professor Peter Diamond to serve on the board of the Federal Reserve, on the grounds that professor Diamond "lacked the necessary qualifications". Since becoming Senate Banking Chairman Shelby has made "regulatory relief and financial regulation reform his top priority". In May 2015, he revealed the so-called "Shelby Bill", easing regulatory restrictions on smaller banks and increasing scrutiny of the Federal Reserve. In May 2015, Shelby introduced legislation that if enacted would increase congressional scrutiny of the Federal Reserve and ease some regulatory burdens on multiple small banks and loosen oversight to banks such as U.S. Bancorp and SunTrust Banks enacted under the Dodd-Frank Act. In a written statement, Shelby referred to the legislation as "a working document intended to initiate a conversation with all members of the committee who are interested in reaching a bipartisan agreement to improve access to credit and to reduce the level of risk in our financial system." Shelby opposes abortion and has stated on his Senate campaign website that Roe v. Wade is "...terribly flawed on both a constitutional and moral basis." Shelby also opposes taxpayer funding of Planned Parenthood and has voted against a short-term funding bill in Congress because it did not defund Planned Parenthood. He advocates a flat tax and supported the Bush Administration's tax cuts. He cites disagreements with the Democrats on tax policy as one of the main reasons he became a Republican; he feels the Democrats are too willing to enact tax increases. Shelby is a signer of Americans for Tax Reform's Taxpayer Protection Pledge. Shelby opposed President Barack Obama's health reform legislation; he voted against the Patient Protection and Affordable Care Act in December 2009, and he voted against the Health Care and Education Reconciliation Act of 2010. In August 2009, Shelby opined that the United States had "the best health care system in the world" and cited the need to expand the system without destroying it. Following Senator Ted Cruz's 21-hour speech opposing the Affordable Care Act, Shelby joined Cruz and 17 other Senators in a failed vote against cloture on a comprehensive government funding bill that would have also continued funding healthcare reform. In September 2017, after the Senate reached an agreement during a lunch to not vote on a Republican bill to repeal the Affordable Care Act that week, Shelby said, "Why have a vote if you know what the outcome is and it's not what you want. I don't know what you gain from that. But I do believe that the health care issue is not dead, and that's what counts." In December 2002, Shelby said, "We don't need another nuclear power -- not with Iran sponsoring terrorism that it has in the past. The fact that they are seemingly pursuing an avenue to build nuclear weapons should be disturbing to everybody." In March 2015, Shelby was one of forty-seven Republican senators to sign a letter to Iran warning that a nuclear deal with the United States would have to first be approved through Congress. In July, Shelby stated that the Joint Comprehensive Plan of Action was "a bad deal" and questioned why the United States would support the agreement if Russia President Vladimir Putin favored it. In September 2016, Shelby was one of thirty-four senators to sign a letter to United States Secretary of State John Kerry advocating for the United States using "all available tools to dissuade Russia from continuing its airstrikes in Syria" from an Iranian airbase near Hamadan "that are clearly not in our interest" and stating that there should be clear enforcement by the US of the airstrikes violating "a legally binding Security Council Resolution" on Iran. In March 2018, Shelby voted to table a resolution spearheaded by Bernie Sanders, Chris Murphy, and Mike Lee that would have required President Trump to withdraw American troops either in or influencing Yemen within the next 30 days unless they were combating Al-Qaeda. Among the bills sponsored by Shelby over the years have been bills to make English the sole language of the federal government, to limit federal government spending by statute, and to provide a moratorium on certain forms of immigration, and to support a Federal Marriage Amendment. In 1999, Shelby was one of ten Republican senators to vote for the acquittal of President Bill Clinton on the charge of perjury when Clinton was tried in the Senate in 1999, although he voted for Clinton's conviction on the charge of obstruction of justice. Shelby opposed the initial bailout proposal to extend billions of dollars in loan money to the Big Three US auto manufacturers. He is often seen as a front man for the GOP Senate opposition. In late 2008, he opposed a Federal government bridge loan for US-owned auto companies, saying: "We don't need government—governmental subsidies for manufacturing in this country. It's the French model, it's the wrong road. We will pay for it. The average American taxpayer is going to pay dearly for this, if I'm not wrong." In December 2010, Shelby was one of twenty-six senators who voted against the ratification of New Start, a nuclear arms reduction treaty between the United States and Russian Federation obliging both countries to have no more than 1,550 strategic warheads as well as 700 launchers deployed during the next seven years along with providing a continuation of on-site inspections that halted when START I expired the previous year. It was the first arms treaty with Russia in eight years. In 2017, Shelby was one of 22 senators to sign a letter to President Donald Trump urging the President to have the United States withdraw from the Paris Agreement. According to the Center for Responsive Politics, Shelby has received more than $60,000 from oil, gas and coal interests since 2012. In the December 2017 Alabama Senate special election, after the Republican nominee for the seat vacated by Jeff Sessions, Roy Moore, was accused of molesting teenage girls as young as fourteen, Shelby stated on CNN that "I think the Republican Party can do better" and "The state of Alabama deserves better." Shelby said he wrote in the name of another Republican on his general election absentee ballot. Shelby claimed to be "relieved" when Moore was defeated in the special election by Democrat Doug Jones. The Shelby Hall Research Center at the University of Alabama is named for Senator Shelby and his wife, a professor emerita at that university. The 200,000 square feet (19,000 m2) new center opened in 2007 and combines mathematics, chemistry and biology research in one building. The Richard C. and Annette N. Shelby Interdisciplinary Biomedical Research Building at the University of Alabama at Birmingham opened in April 2006. The 12 story building cost $70 million and is 310,000 square feet (29,000 m2). The Senator Richard C. and Dr. Annette N. Shelby Center for Engineering Technology, part of the Samuel Ginn College of Engineering at Auburn University, was dedicated on April 18, 2008. Shelby helped secure $30 million of the $54 million cost of Phase I of the project. In Mobile, Alabama, Shelby Hall houses the University of South Alabama College of Engineering and School of Computer and Information Sciences. The 155,000 square feet (14,400 m2) facility was named after Senator Richard C. and Dr. Annette N. Shelby for their commitment to higher education in the state of Alabama. Senator Shelby was instrumental for securing $40 million in Federal grants to fund the $50 million project. The building was dedicated on Sunday, September 9, 2012. The 207,000-square-foot Shelby Center for Science and Technology was dedicated at the University of Alabama in Huntsville in October 2007. The $60 million facility is named for Sen. Richard Shelby. It includes 18 teaching laboratories, 13 classrooms, 15 research laboratories, two teaching auditoriums, and 146 offices. ^ 52 Republicans and 38 Democrats voted for the bill. Shelby voted against it as did 7 Democratic Senators: Barbara Boxer (Calif.), Richard Bryan (Nevada), Byron Dorgan (N. Dakota), Russell Feingold (Wisc. ), Tom Harkin (Iowa), Barbara Mikulski (Maryland) and Paul Wellstone (Minn.) Sen. Peter Fitzgerald (R-Illinois) voted "present", while Sen. John McCain (R-Arizona) did not vote. ^ Thornton, William (March 3, 2019). "Richard Shelby now Alabama's longest serving senator". AL.com. Retrieved March 3, 2019. ^ "Richard C. Shelby, Jr". Washington Post. June 30, 2004. Retrieved February 23, 2009. ^ "1". Freepages.genealogy.rootsweb.com. Retrieved November 3, 2010. ^ "Richard Shelby (R)". Washington Post. Retrieved June 4, 2014. ^ "Conservative Senators – #6 – Richard Shelby". conservativeamerica-online.com. Retrieved August 2, 2016. ^ "Sen. Richard C. Shelby (R-Ala.)". Roll Call. Retrieved August 15, 2014. ^ Dean, Charles (June 30, 2014). "Could the Tea Party challenge Sen. Richard Shelby? Sure, but there are $17 million reasons not to". AL.com. Retrieved July 1, 2014. ^ "SurveyUSA News Poll #15743". Surveyusa.com. Retrieved August 29, 2010. ^ a b Colby Itkowitz (October 1, 2014). "Sen. Shelby eats and travels in style on campaign and PAC funds, but doesn't share". Washington Post. Retrieved June 16, 2015. ^ Minzesheimer, Bob (October 5, 1987). "President to stick with Bork to end". USA TODAY. ^ "Heflin: When in Doubt, Don't". October 7, 1987. ^ "New Ways to Recognize Tribes Split Indians". New York Times. August 4, 1991. ^ Indianapolis Star, March 19, 1997, p. 7. ^ "U.S. Senate: Legislation & Records Home > Votes > Roll Call Vote". Senate.gov. Retrieved November 3, 2010. ^ Biden, Joseph (June 6, 1991). "S.1241". Library of Congress. ^ "Shelby urges another cut in interest rates". Times Daily. January 29, 1992. ^ "Consumer Unit Born of 2008 Crisis Would Be Shelby Target". Businessweek. October 23, 2014. Retrieved October 27, 2014. ^ "CIA director's allies outrank his enemies". usatoday.com. Retrieved August 2, 2016. ^ "Alabama Senator Richard Shelby named chairman of the Senate Banking Committee". al.com. Retrieved August 2, 2016. ^ Lengel, Allan; Priest, Dana (August 5, 2004). "Investigators Concluded Shelby Leaked Message". Washington Post. Retrieved August 23, 2008. ^ McMurray, Jeffrey. "Committee Ends Leak Probe of Sen. Shelby". Retrieved August 2, 2016 – via washingtonpost.com. ^ Scott Woolley (November 13, 2006). "Magazine Article". Forbes.com. Retrieved November 3, 2010. ^ a b "Richard Shelby – Candidate for US Senate in Alabama (AL) – Crowdpac". crowdpac.com. Retrieved August 2, 2016. ^ "Embryonic stem cell reversal is distraction, congressman says". CNN. March 8, 2009. ^ Phillips, Kate (March 23, 2009). "National Service Corps Bill Clears Senate Hurdle". The New York Times. ^ Collins, Gail (February 6, 2010). "No Holds Barred". The New York Times. Retrieved May 22, 2010. ^ a b "How transparent is the Senate's hold process?". CNN Fact Check. February 12, 2010. Retrieved May 22, 2010. ^ Wilson, Scott., Murray, Shailagh. Sen. Richard Shelby of Alabama holding up Obama nominees for home-state pork. The Washington Post. February 6, 2010. ^ a b Meredith Shiner. "Richard Shelby lifts hold on Obama nominees". Politico.Com. Retrieved August 29, 2010. ^ Allysia Finley (September 24, 2014). "Stingy Republican Lawmakers". Wall Street Journal. Retrieved June 16, 2015. ^ "Senate rejects GOP oil drilling plan". CNN. May 18, 2011. ^ "Key Republican Lawmaker Calls for Review of Fed Structure". The Wall Street Journal. March 3, 2015. ^ "Orrin Hatch to back nuclear option if needed to confirm Gorsuch". CNN. March 27, 2017. ^ "Exclusive: Grassley urges Trump to reconsider controversial judicial picks". CNN. December 12, 2017. ^ "Paul seeks to cut off Planned Parenthood funds via massive spending bill". The Hill. August 20, 2018. ^ "Shelby: Deal close on third minibus spending package". The Hill. September 26, 2018. ^ "Senior GOP senator warns Trump against partial shutdown". The Hill. November 15, 2018. ^ "GOP negotiator: Trump didn't move the needle on border wall". The Hill. February 5, 2019. ^ Bloch, Matthew; Fairfield, Hannah; Harris, Jacob; Keller, Josh; reporting, Derek Willis/The New York Times Kitty Bennett contributed (December 19, 2012). "How the National Rifle Association Rates Lawmakers". The New York Times. Retrieved October 4, 2017. ^ Levingston, Ivan (June 21, 2016). "A heated Shelby defends gun vote, also questions Fed credibility". CNBC. Retrieved October 4, 2017. ^ Beasley, Jere (December 16, 2010). "Senator Shelby doesn't like the Earmark Ban". Jere Beasley Report. Retrieved September 27, 2011. ^ Morring, Frank (August 25, 2011). "Senators Disagree On SLS Approach". Aviation Week and Space Technology. Retrieved September 27, 2011. ^ Shelby, Richard (July 10, 2011). "Letter to NASA Administrator Charles Bolden" (PDF). ^ "A (partial) SLS competition in the works?". Space Politics. ^ Wilkinson, Everett. "TEA Party Catches Congress Hiding Earmark In Space". Tea Party Wire. Archived from the original on September 20, 2011. ^ Gasser, Andrew. "Are Republican Senators Trying to Kill NASA?". Tea Party in Space. Archived from the original on October 14, 2011. ^ Simberg, Rand. "Blame Congress and Pork, Not NASA". ^ Roop, Lee. "SpaceX's Elon Musk, Sen. Richard Shelby spar over Obama space policy". The Huntsville Times. ^ "Senator Shelby assail bonuses paid to executives at AIG". wtvy.com. Archived from the original on October 5, 2015. Retrieved August 2, 2016. ^ Grim, Ryan (May 18, 2010). "Attempt To Cap ATM Fees At 50 Cents Blocked In Senate". Huffington Post. Retrieved May 19, 2010. ^ Cover, Matt (May 7, 2010). "Sen. Shelby: Financial Reform Violates Privacy". CNSNews.com. Retrieved May 19, 2010. ^ a b Michael Flaherty (May 12, 2015). "Senate Banking bill proposes several changes for Fed: source". Reuters. Retrieved June 17, 2015. ^ Connolly, Amy R. (May 12, 2015). "Bill would increase scrutiny of Federal Reserve, ease restrictions on small banks". UPI. ^ "Issues – Richard Shelby for U.S. Senate". shelbyforsenate.com. Retrieved August 2, 2016. ^ "The Voter's Self Defense System". votesmart.org. Retrieved August 2, 2016. ^ "Boll Weevil to GOP: 20 years of Sen. Richard Shelby as a Republican in today's political update". al.com. Retrieved August 2, 2016. ^ "U.S. Senate: Roll Call Vote". senate.gov. Retrieved August 2, 2016. ^ "Democratic senator: Public health insurance option dead". CNN. August 16, 2009. ^ "Twenty-five Republicans buck Cruz on shutdown". Politico.com. September 27, 2013. Retrieved October 10, 2013. ^ "Senate won't vote on last-ditch Obamacare repeal bill". Politico. September 26, 2017. ^ Ensor, David (December 13, 2002). "U.S. has photos of secret Iran nuclear sites". CNN. ^ "See list of Republican Senators who support Iran letter". CNN. March 10, 2015. ^ "The Hill's Whip List: Obama has 42 Senate votes for Iran deal". The Hill. July 14, 2015. ^ Kheel, Rebecca (September 19, 2016). "GOP pressures Kerry on Russia's use of Iranian airbase". The Hill. ^ "English-Only Initiatives Before The Congress". civilrights.org. Retrieved August 2, 2016. ^ "Shelby urges colleagues to fund the government; Legislation avoids shutdown, adheres to spending caps". northwestgeorgianews.com. Retrieved August 2, 2016. ^ "Congress.gov – Library of Congress". loc.gov. Retrieved August 2, 2016. ^ "Shelby Statement on Federal Marriage Amendment". senate.gov. Retrieved August 2, 2016. ^ "How the senators voted on impeachment". cnn.com. February 12, 1999. Retrieved August 2, 2016. ^ "Shelby warns of filibuster of auto bailout". politico.com. Retrieved August 2, 2016. ^ "'Meet the Press' transcript for Nov. 16, 2008". nbcnews.com. November 16, 2008. Retrieved August 2, 2016. ^ Weigel, David; Helderman, Rosalind S. (December 10, 2017). "As Alabama prepares to vote, Republican Sen. Richard Shelby says state 'deserves better' than Moore". The Washington Post. Retrieved December 13, 2017. ^ Shelby bucks his party and president to oppose Moore for Senate, Washington Post, December 10, 2017. Retrieved December 11, 2017. ^ Levin, Marianne. "Senate approves Trump-backed criminal justice overhaul". Politico. Retrieved December 18, 2018. ^ a b c d e f g h i "Richard Shelby, Senator for Alabama". GovTrack.us. Retrieved August 2, 2016. ^ "The University of Alabama". ua.edu. Retrieved August 2, 2016. ^ "Senator Richard Shelby Interdisciplinary Biomedical Research Institute – Learning Spaces Collaboratory". pkallsc.org. Retrieved August 2, 2016. ^ "New Auburn University tech center dedicated to U.S. Sen. Richard C. and Dr. Annette N. Shelby". The Birmingham News. April 24, 2008. ^ Busby, Renee (September 9, 2012). "USA dedicates new Shelby Hall building on campus". Press-Register. Retrieved February 28, 2013. ^ "Shelby Hall Dedication" (PDF). University of South Alabama. Retrieved February 28, 2013. ^ "Shelby Engineering Centers – State of Alabama Engineering Hall of Fame". ua.edu. Retrieved August 2, 2016. ^ "Shelby Center at UAH – Encyclopedia of Alabama". encyclopediaofalabama.org. Retrieved August 2, 2016. ^ Administrator, Joomla!. "UAH Shelby Center for Science & Technology". mdmechanical.com. Retrieved August 2, 2016. ^ Guthrie, Benjamin J. (April 1, 1979). "Statistics of the congressional election of November 7, 1978" (PDF). Clerk of the United States House of Representatives. Retrieved August 1, 2010. ^ Ladd, Thomas E. (April 15, 1981). "Statistics of the presidential and congressional election of November 4, 1980" (PDF). Clerk of the United States House of Representatives. Retrieved August 1, 2010. ^ Ladd, Thomas E. (May 5, 1983). "Statistics of the congressional election of November 2, 1982" (PDF). Clerk of the United States House of Representatives. Retrieved August 1, 2010. ^ Ladd, Thomas E. (May 1, 1985). "Statistics of the presidential and congressional election of November 6, 1984" (PDF). Clerk of the United States House of Representatives. Retrieved August 1, 2010. ^ Dendy, Dallas L., Jr. (May 29, 1987). "Statistics of the congressional election of November 4, 1986" (PDF). Clerk of the United States House of Representatives. Retrieved August 1, 2010. ^ Dendy, Dallas L., Jr. (May 31, 1993). "Statistics of the presidential and congressional election of November 3, 1992" (PDF). Clerk of the United States House of Representatives. Retrieved August 1, 2010. ^ Trandahl, Jeff (January 3, 1999). "Statistics of the congressional election of November 3, 1998". Clerk of the United States House of Representatives. Retrieved August 1, 2010. ^ Trandahl, Jeff (June 7, 2005). "Statistics of the presidential and congressional election of November 2, 2004". Clerk of the United States House of Representatives. Retrieved August 1, 2010. ^ "Alabama US Senate Primary Results". Politico. June 1, 2010. Retrieved June 1, 2010. ^ "2016 Primary Election Official Results, March 1, 2016". Alabama Secretary of State. Retrieved May 13, 2016. ^ "Canvass of Results for the General Election held on November 8, 2016" (PDF). Alabama Secretary of State. Retrieved December 1, 2016. Bamford, James (2004). A Pretext for War: 9/11, Iraq, and the Abuse of America's Intelligence Agencies. New York: Doubleday. pp. 127–131. ISBN 0-385-50672-4. 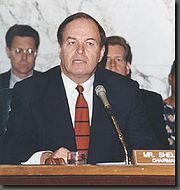 Wikimedia Commons has media related to Richard Shelby. This page was last edited on 15 April 2019, at 19:47 (UTC).